When I think of comfort food, one of my all time favorite foods, doughnuts, comes to mind. Doughnuts make me think of my childhood, especially of my dad, because they were one of his favorite snacks. When I was little, we always had at least one box of Entenmann’s donuts and a coffee cake in the house. My mom would have a piece of coffee cake with her morning coffee and dad would have an Entenmann’s old fashioned cake donut which he dunked in his. The tradition of enjoying an Entenmann’s doughnut with a cup of coffee in the morning continued with me throughout my life. My kids all love the Entenmann’s products and they have become as much of a Sunday morning staple in our home as the Sunday comics. 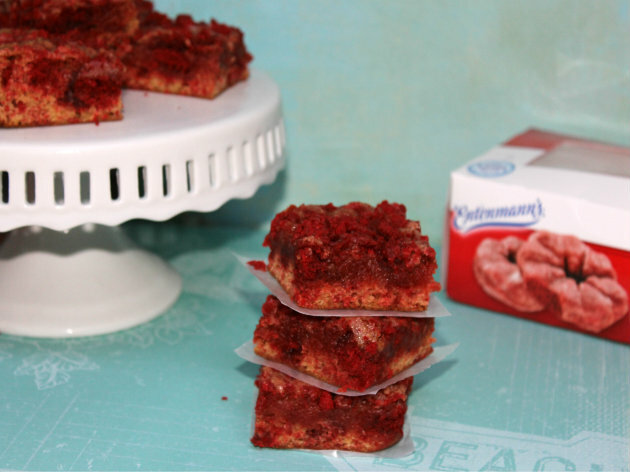 Today is National Donut Day, and what better time for the Salvation Army and Entenmann’s to roll out the red carpet for the debut of the brand new Red Velvet Donuts from Entenmann’s. The Salvation Army has been celebrating National Donut Day since 1938, when in Chicago, they were trying to raise money during the Great Depression. During WWI, Donut Lassies, female volunteers, passed out these delicious delights to the soldiers. This sweet treat became so synonymous with the soldiers, they earned the name “doughboys.” In their continued support of the Salvation Army, Entenmann’s will donate $1 for every like they get on their Facebook page through June 30, up to $30,000. 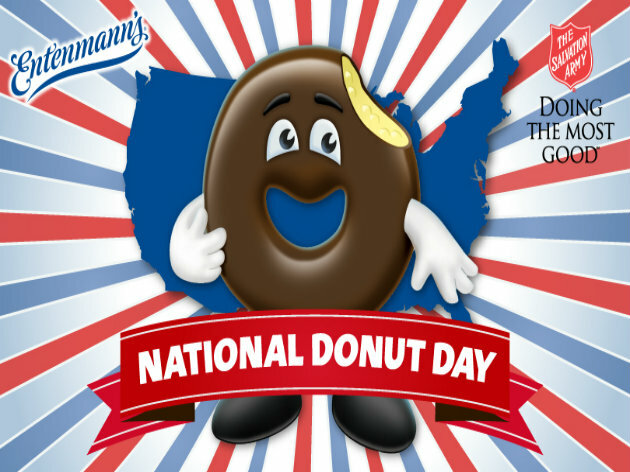 In addition, Entenmann’s will be rewarding lucky FB fans with Free Donuts for a Year as well as several other prizes through the sweepstakes link on the Entenmann’s Facebook page. I was sent a box of the new Entenmann’s Red Velvet Donuts and oh boy are they divine! Caitlin and I are both huge red velvet lovers, so it took all we had not to devour the entire box before I made my recipe! 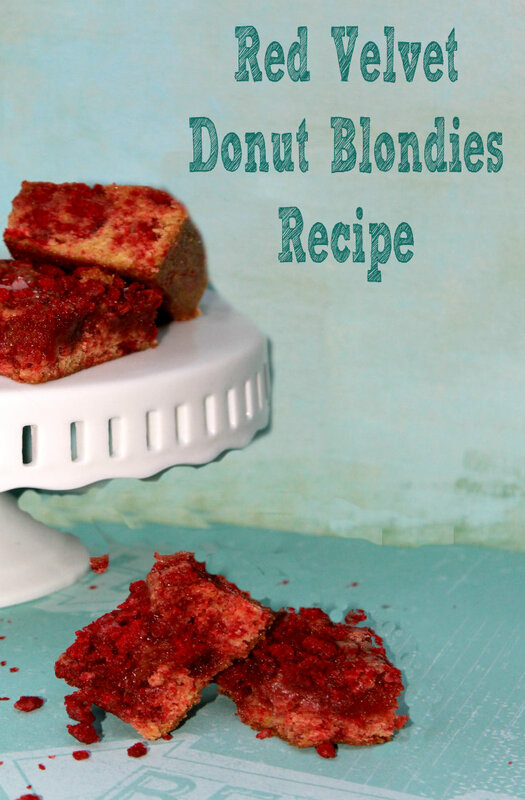 The donuts are a rich and moist red velvet cake with a sweet cream cheese glaze. They literally melt in your mouth! They come 8 to a box and they are the large donuts you expect from Entenmann’s. I must say, this was one of the easiest recipes I have made in a long time. I had practically all of the ingredients in my pantry, the prep time was short and the brownies were ready in just 20 minutes. These are honestly one of our new favorite snacks in the house. I had to fend off the family with a stick just to take pictures! The moment I snapped my last picture, the kids grabbed the donut box and ran into the bedroom and locked the door! Henry was yelling “No more pictures” over and over as he stuffed brownies in his mouth! I hope your family enjoys them as much as mine did! In a medium saucepan, combine brown sugar and butter and heat over medium until butter is melted, the sugar melts and the mixture is smooth, stirring constantly. Allow to cool slightly. Stir eggs into saucepan, one at a time, add vanilla and stir. Combine flour, baking soda and baking powder and salt in a separate bowl and then add to saucepan. Mix all ingredients thoroughly and add in ¾ of the donut pieces. Pour mixture into baking pan and top with remainder of donut pieces. Bake for 25-30 minutes or until center is set and blondies are lightly golden brown. Cool for one hour before cutting into squares. One USA reader will win an Entenmann’s Prize Pack including coupons and a super cute nylon bag ARV $50. What is your favorite Entenmann’s product?